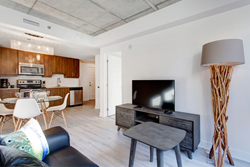 Already the 2016 Consumer’s Choice Award for Best Corporate Housing Provider in Montreal, CorporateStays.com is continuing its growth and meeting increasing demand in the Canadian market with a new modern building in Montreal, Quebec. BnC, an hidden gem in the sought-after Quartier des Spectacles neighbourhood in Montreal. The BnC is designed to be a contemporary oasis, complete with the modern traveller in mind. The BnC is designed to be a contemporary oasis, complete with the modern traveller in mind. Airy and spacious, it utilizes trendy wood and concrete accents for a smart industrial look. These natural materials and oversized windows tie in seamlessly with the carefully selected furnishings, giving the living space a welcoming, personalized atmosphere. Business and leisure travellers alike will be able to appreciate the incredible amount of thought and detail put into making the apartments at BnC a charming addition to the city. Guests of BnC can take advantage of a wide range of convenient amenities, making their stay all the more enjoyable. A well equipped fitness centre is just inside so no guest has to break their exercise regime, and a large terrace and BBQ area allows guests to enjoy the residential community. With the addition of a doorman and 24-hour concierge, conveniently accessible through the CorporateStays.com mobile app, guests can get insider knowledge and live in the city like a true local. Centrally located in the Quartier des Spectacles area, the BnC is within walking distance to a number of local hot spots. The immediate area surrounding the BnC is loaded with conveniences like pharmacies, supermarkets, and popular shopping, dining, and entertainment destinations, while Downtown, Old Montreal, Chinatown, and the Gay Village are just a quick stroll away. Farther destinations are easily accessed by the three nearby Metro stations, bus terminal, and car and bike rental services. Those living in the BnC get to spend less time travelling and more time being productive and experiencing the area. A huge advantage the BnC gives guests is the ability to make it their very own home - long term. More cost-effective, convenient, and comfortable than a hotel, an extended stay at the BnC comes with the full CorporateStays.com experience and additional discounts depending on the length of time. This way, guests that are expecting to relocate, spend further time in the city, or just love their fully serviced apartment can continue to reap all of the benefits that comes with booking at CorporateStays.com! It is with pleasure that CorporateStays.com welcomes any visitors to Montreal to stay at the BnC. As a one-stop-shop for any traveller’s hospitality needs, any trip to Montreal will be completely taken care of, stress-free!